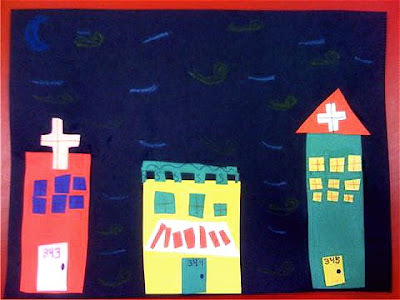 Here is only one example of the city collages I did with 2nd graders. Many of them are more detailed then this, but I just snapped a quick picture of this one yesterday for blog-world. I gave every student a 9x12 sheet of black paper and access to a major scrap cart filled with lots of colors. Its a huge mess, basically :-) They constructed their own cities, added details with thin markers, then added a night time sky with oil pastels. i love how they put the address numbers on all the doors. so cute!